From chilling temperatures to slippery sidewalks, winter is a season that brings unique safety concerns. Keep your family cozy and safe this winter by remembering a few important tips. Winter comes with a few hazards for homeowners, but there are plenty of things you can do to protect your property and your family. Keep these tips in mind. The fact that your central heating unit, space heater, or fireplace was working properly at the end of last season does not mean it's ready for this winter. Before frigid temperatures set in, hire a professional to conduct a safety inspection of your heating units, as well as your fireplace's flue and chimney. If any potential risks are found, act immediately to remedy them. If you'll be using space heaters, make sure your rooms have proper ventilation and that the units are not placed near anything flammable. Using unsafe heating systems can result in fire, injuries, or carbon monoxide poisoning. According to the Centers for Disease Control and Prevention (CDC), more than 400 people die annually of carbon monoxide poisoning. Carbon monoxide is a colorless, odorless vapor that is sometimes produced by gas furnaces and space heaters. Symptoms of carbon monoxide poisoning include nausea, dizziness, severe headache, confusion, and unconsciousness. If you notice these symptoms in yourself or a family member, go to the emergency room right away. If you have a central gas heater, use gas-powered space heaters, or have a fireplace, install carbon monoxide detectors in your home. These inexpensive devices, which are available from retailers like Target and Amazon, provide a warning if you have elevated carbon monoxide levels in your home. Even if you already have detectors, make sure they are in proper working order and change the batteries so you can be certain that they're fresh. When temperatures dip below freezing, it's important to take steps to prevent ruptured plumbing. To prevent burst pipes, leave water dripping slightly so that water is constantly running through them to reduce the chances of freezing. Additionally, open the cabinets in which indoor pipes are housed so they are exposed to the warmest temperatures in your home. Outdoor pipes should be wrapped with sufficient insulation to reduce exposure to the elements. Never leave a hose attached to an outside faucet during the winter months. According to the CDC, falls are the number one cause of injuries to adults. Many of these falls happen when sidewalks, driveways, and walkways are covered in snow and ice. Make sure any of these surfaces around your home are shoveled regularly and free from debris. Keep in mind that simply clearing the snow may not be enough to keep the area safe; ice is always a concern during the winter. Your regular routine for keeping access to your home clear should include adding sand or rock salt to slippery spots. Pay particular attention to stairs, since they can be hazardous and icy in colder months. Always be careful when clearing snow and ice around your home, and keep a few snow removal safety tips in mind. In addition to making sure that your home is prepared and stocked to deal with the winter weather situations that you can expect as the days get shorter and the temperatures drop, it's also important to consider winter safety tips for the activities that you and the other members of your family are likely to participate in this time of year. According to the National Institute of Health, anyone who spends extended periods outside in cold winter temperatures is at risk for hypothermia. Hypothermia can happen when your body temperature drops from its usual 98.6 degrees. It is a medical emergency if a person's temperature is 95 degrees or less. When heading outdoors to participate in wintertime activities, whether you'll be hiking, skiing, shoveling snow from your driveway, or any other outdoor activity, make sure that you dress warmly. It's wise to dress in layers when you'll be exerting yourself in frigid temperatures so that you can start out properly insulated and then shed layers as your body temperature starts to rise as a result of your level of activity. Make a point of wearing clothing made from synthetic materials to help conserve body heat. Avoid wearing clothing made from cotton fibers. If cotton gets wet, it takes some time to dry and during that time, you run the risk of becoming severely chilled and losing much-needed body heat. According to the Minnesota Department of Natural Resources, it can be very difficult to tell whether ice is solid just from looking at it. The color or thickness of the ice will not necessarily tell you how much weight it can support. In general, new ice, which has formed in the last couple of weeks, is stronger than ice that has been there for months. Ice on moving water, such as rivers, is generally weaker than ice on lakes. Always consult your local DNR about ice safety before heading out on the lake for ice fishing, ice skating, or other sports. Skiing and snowboarding can be enjoyable winter pastimes, but you still need to keep personal safety in mind when you venture out onto the slopes. Wearing a helmet will help to prevent head injuries. If you don't own the right equipment, rent it from the ski resort. Many winter sports require specific equipment. Make sure that your equipment is in good condition and properly maintained. For example, snow skis need to be properly waxed, ice skate blades need to be sharpened, and snowmobiles should be serviced at the beginning of each season. It's also important to make sure that sized items, such as snow ski boots and ice skates, are properly fitted. Because children grow so rapidly, there's a good chance they'll need a larger size each season. Taking breaks at regular intervals is a good idea when you are enjoying the great outdoors in the winter. Go inside to warm up and get a snack and something to drink. While it may tempting to go on one more run as the day winds down, a safer choice may be not to push yourself if you are already tired. Before you head out in the snow, tell someone where you are going and what time you will be coming back. That way, if you are overdue, someone can alert authorities to start searching for you. It's also important to stay on well-marked trails. 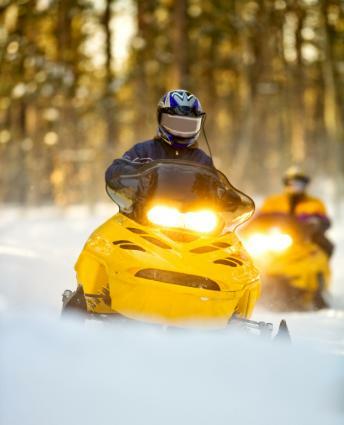 Take a trail map with you and keep track of where you are while snowmobiling or skiing. Winter also comes with driving hazards. Before you head out on the road this season, read up on winter driving safety tips. From choosing the right tires to controlling your car on ice, it's important to keep these items in mind. These are just a few of the many important safety tips that need to be observed to enjoy a safe, healthy and enjoyable winter season.